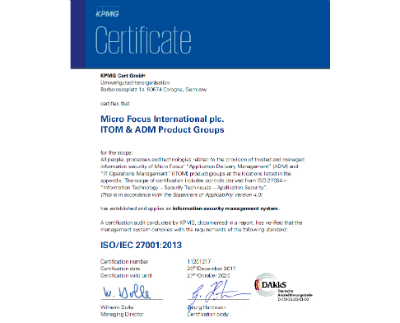 Our mission is to assure the secure development and delivery of Micro Focus software products, increase trust among our customers and address and resolve security incidents. Our goal is to increase trust among our customers and address and resolve security incidents. Provides customers with proactive notification of security threats and serves as a response center for effective vulnerability management and resolution. ISO 27034-1 application security standard, demonstrates proactive integration of security as part of Micro Focus software development lifecycle.